Back in 2011, Haynes released spoof book of the Millennium Falcon “Owners Workshop Manual“. Written and illustrated by Ryder Windham, Chris Reiff and Chris Trevas, It was a tongue in cheek book based on their extensive and well known range of vehicle owners guides. It is an excellent read and if you don’t have one in your Star Wars Library, I thoroughly recommend you get one. This year, Haynes release an update which encompasses a multitude of additions to the Millennium Falcon canon as we saw in “Solo: A Star Wars Story”. It’s 128 pages of densely packed information and It’s a good looking tome. 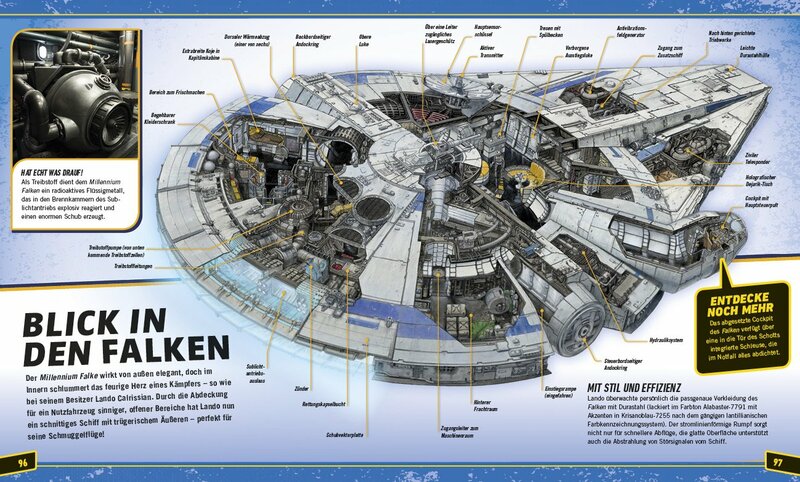 At the moment, I have only glanced through, but there is quite a lot of new artwork on the inner workings on the Falcon. Some is from Solo as seen by these page featuring the damages sustained by the Falcon on her historic journey through the maelstrom and the “YT Dart” and the changed internal layout on the cover. The attention to detail is stunning. As well as imaging elements that we saw in Solo, they’ve also added elements of the Falcon from the Expanded Universe and the toys, such as the unreleased Kenner “Cargo Handler” and Hasbros’ BMF’s escape pod as well. Some is based on the new artwork created by for DeAgostini’s Build The Millennium Falcon and some is brand new. The attention to detail here is excellent and the co authors have really thought out every detail of the Falcon and her inner workings. I bought my copy from Amazon, but you can buy both the original and the update direct from Haynes. I must confess to being a little surprised that we haven’t seen a DK Cutaway book release for Solo. I also see that the excellent Millennium Falcon 3D Owners Guide is being rereleased for the Sequel Trilogy. I wonder if we’ll see an Owners Guide for Solo as there are a lot of differences. This entry was posted in Books and tagged Millenium Falcon, Millennium Falcon, Star Wars. Bookmark the permalink. Thanks Brian. I have this book at home, but didn’t look too hard. I completely missed that cross section. Thanks, man. I can’t find that image anywhere. Is it Kemp Remillard?